I am thrilled to be an Oasap Fashion Hunter Blogger. Oasap is a high end online fashion retailer and has high end style with inexpensive pricing. My teen daughter chose 2 pairs of leggings for my review; a black pair and a grey pair. The site was easy to navigate and the ordering process was easy all the way through checkout. When she received them they were packaged well and they were also shipped very fast. The leggings look cute on and fit her perfectly. I will say they run true to size. So if you order you need to make sure you order your correct size and shoot them an email if you aren’t sure about sizing because sizing is not Us sizing; it’s all in CM’s. To the side of this is a picture of my daughter wearing the black pair. She also made a collage to show the detailed cutouts that she loves. The cutouts are sewn into the leggings and are made from lace material. I believe the cutouts make the leggings. If they did not have those cutouts they would not look cute, they would just look like normal boring leggings. The site has tons of clothing, accessories and even shoes. Prices are as low as $8 and as high as $200. I would say the pricing is actually really reasonable for the style and quality of the clothing. If it helps, my daughter is a size 1 in US clothing and the leggings have enough room to accommodate larger size but they are one size fits all and I would say that is not necessarily true. I would not think a size large would fit into these leggings. If in doubt just email the company for sizing help. The only thing negative I have to say is one pair of the leggings had broken seams. Since I am a seamstress I was able to fix this easily. The company did offer to reship but I declined since it was such a simple fix for me. I would still order from the company despite the broken seam as it wasn’t that big of a seam break., it was less than an inch. I received a $30 credit so I could pick something to review. My opinion is my own and I review things that my family is truly interested in. My review is based on a family members true opinion of the product. 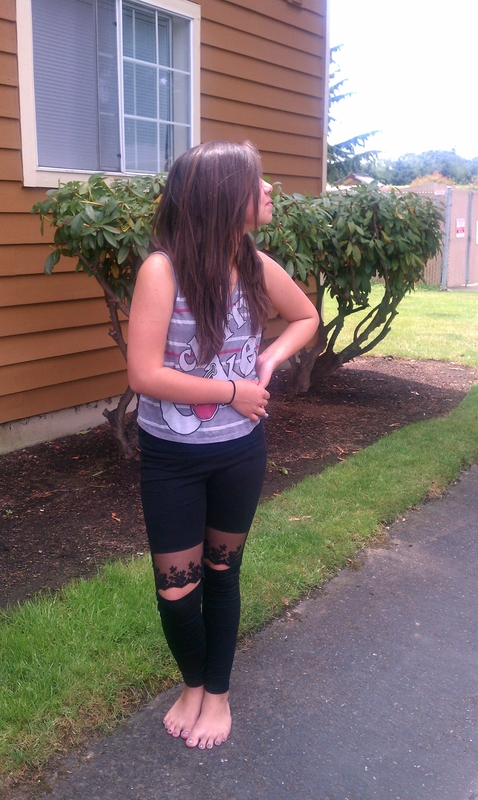 Great looking leggings, I love the cutouts they are very stylish and look great on your teen. I have seen their site and have tons of inexpensive clothing. I am glad to hear they have good customer service too! What a neat site! Thanks for the heads up about sizing! It’s always disappointing to get the wrong size shipped for something you can’t wait to get! Loooove OASAP! I actually just ordered 2 purses from them 🙂 Those leggings look really cool though. I love the variety that they have. Those leggings look really cute. I loooove the styles on the site! And pricing is reasonable for then as well! Thanks for the review, very informative! My daughter loves clothes too! Great review! These are to cool, makes me think of super chic hippie wear! Totally Awsome!! !